When it comes to achieving maximum health and wellness, you need a variety of vitamins and minerals in your diet. For instance, vitamin C helps bolster your immune system and can protect you against cardiovascular disease, and vitamin A is important for eye health and protecting your cells from oxidative damage. 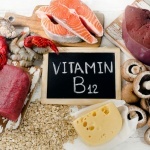 However, another vitamin that you need for proper functioning is vitamin B12. And, as it turns out, intrinsic factor plays a key role in its absorption. These symptoms may be barely noticeable at the onset of the deficiency but often become more apparent as the vitamin B12 becomes more depleted in your body. To know for sure whether you are deficient, blood tests should be conducted to test levels of B12 and the number and appearance of red blood cells. 1 National Institutes of Health, Office of Dietary Supplements. “Vitamin B12: Fact Sheet for Consumers.” U.S. Department of Health & Human Services, National Institutes of Health. http://ods.od.nih.gov/factsheets/VitaminB12-Consumer/. Reviewed June 2011. Accessed February 2015. 2 Natural Medicines Comprehensive Database. “Vitamin B12.” WebMD. http://www.webmd.com/vitamins-supplements/ingredientmono-926-vitamin%20b12.aspx?activeingredientid=926&activeingredientname=vitamin%20b12. Accessed February 2015. 3 National Heart, Lung, and Blood Institute. “What is pernicious anemia?” U.S. Department of Health & Human Services, National Institutes of Health. http://www.nhlbi.nih.gov/health/health-topics/topics/prnanmia. Published April 2011. Accessed February 2015. 4 Mayo Clinic Staff. “Vitamin deficiency anemia.” Mayo Clinic. http://www.mayoclinic.org/diseases-conditions/vitamin-deficiency-anemia/basics/symptoms/con-20019550. Published January 2014. Accessed February 2015.